It’s been two-and-a-half years since The Office came to a close on NBC, but American workplace sitcoms—and the network that broadcasted the show—are still working through their Dunder Mifflin hangover. The Peacock recently let go of a direct Office descendant (Parks And Recreation), while another (Brooklyn Nine-Nine) carries on over at Fox. Even when The Muppets returned to TV this fall, their interpersonal squabbles and backstage capers were made to fit the prototype that Ricky Gervais and Stephen Merchant rolled out of the Slough Trading Estate at the start of the last decade. Like his former colleagues Greg Daniels and Michael Schur, Office alum Justin Spitzer injects more than a little of his previous show’s DNA to his latest project for NBC. More than once in the pilot of Superstore, the staff of fictional big-box retailer Cloud 9 resemble their Scrantonian ancestors, minus the on-camera confessionals. Superstore splits Dwight Schrute in half, with obsequious sales associate Mateo (Nico Santos) inheriting Dwight’s brown nose, and belligerent assistant (to the) store manager Dina (Lauren Ash) getting his authoritarian streak. Floor manager Amy (America Ferrera) and new hire Jonah (Ben Feldman) star as the Pam and Jim figures, respectively, both presumably overqualified yet lacking the necessary motivation to get out of their current situation. (Like any good Pam, Ferrera’s romantically involved with a man who’s not her Jim—for now.) The show even borrows a signature device from the original Office, playing within the restrictions of its static setting by substituting vignettes of workplace purgatory for traditional establishing shots. Only, in these cases, it’s a customer shitting in a display toilet instead of a burbling water cooler or collating photocopiers. But more than any of that, Superstore shares a fundamental question with The Office: How do you end up in a place like this? Amy got pregnant and married at age 19, and she’s been at Cloud 9 for the 10 years since, which makes her particularly protective of the store’s expectant teen mom, Cheyenne (Nichole Bloom). Jonah’s past is cloudier, but Spitzer’s pilot script and Feldman’s nervy performance make it clear that he’s not “better” than working in retail. In the show’s view, Cloud 9 is beneath no one, not even the idealist with the flowery vocabulary. (“Did you just use ‘moments of beauty’ conversationally?’” Amy says to him on his first day.) It’s an important tone for Superstore to strike right off the bat, and it allows the show to evolve its “How did I get here?”s to “What do I do here?”s. What they do is standard workplace fare, pre- or post-Office: Staff meetings, prank wars, furtive flirting that they swear isn’t furtive flirting. Pilot director Ruben Fleischer (who’s also an executive producer) puts his action-comedy experience to use in a pair of showstopping set pieces, but later episodes make those look more like an exception than a rule. It’s easier for Superstore to flesh out its characters when they’re freed from storylines about the daily grind, but the show does find occasional inspiration there: Building a groom-and-groom wedding-sale display helps Mateo find the compassionate side of outwardly conservative manager Glenn (Mark McKinney), while Amy bonds with Dina on a quest to track down Cheyenne’s runaway fiancé (Johnny Pemberton, doing scene-stealing work with an objectively aggravating character). 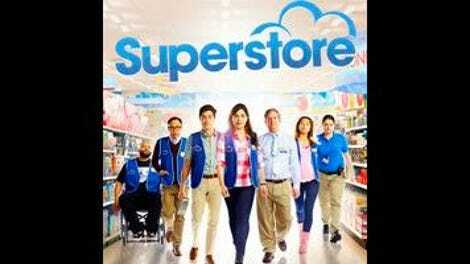 The second of the two Superstore episodes premiering on November 30—the show moves to its regular night and time, Mondays at 8 p.m. Eastern, on January 4—unearths an early series highlight in the cat-and-mouse game between paraplegic Garrett and the photographer trying to track him down for an “inspirational” cover of the Cloud 9 employee magazine. That last storyline presents a challenge to Superstore that never faced any version of The Office: The store may prove more interesting than the people who work there. Big-box retailers are ripe for a TV send-up, and Spitzer and company have clearly had a lot of fun building the world of Cloud 9. Some of their funniest jokes are at the expense of the chain’s wares, including some inventive promos made to look like ads for Cloud 9 blowouts. The commercials are funny, but they also have the effect of reducing a charismatic cast to little more than the grinning faces next to dubious deals like trick-or-treating knockoffs and Halloween merchandise repurposed for Thanksgiving. If Superstore is to do for the smock-and-name-tag crowd what The Office did for cubicle dwellers, deep discounts on “Goggle-Wearing Villain Helper” costumes can’t be the most compelling reason for a weekly visit.